Lett Her Bea, under jockey Mark Jasso, defeats Dig Deeper in the $12,500 Wayne Brasher Memorial (not black type) Sunday afternoon at Turf Paradise. PHOENIX, AZ—NOVEMBER 4, 2018—Lett Her Bea won the first stakes of her career as she notched a half-length victory in the $12,500 Wayne Brasher Memorial Stakes (not black-type) at Turf Paradise on Sunday afternoon. 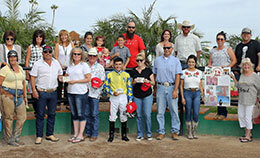 Mark Jesso rode the 5-year-old mare to victory in her seventh career win. It was her 24th lifetime start but only her second in Arizona. Prior to Sunday’s stakes race, she had been racing in allowance company at Los Alamitos, where she enjoyed a three-race win streak last winter. Lett Her Bea ($31.80) was 4-1 on the morning-line. She covered the 300-yard distance in 15.452 to earn a 97 speed index in a gate-to-wire victory from the two hole. Lett Her Bea is trained by Matt Fales for owner Kyle Hause. She was bred in Oklahoma by Bobby Cox, by Ivory James and out of Lett Her Zoom, by Shazoom. Second place finisher Dig Deeper and jockey Ricardo Martinez completed the exacta at odds of nearly 25-1. Dig Deeper is a 3-year-old gelded son of One Sweet Jess, owned and trained by Alex Torres-Casas. Dig Deeper was bred in California by Martha Wells, out of the Corona Cartel mare Halfpast Aheartbreak. He qualified for the AZQRA Futurity in December of 2017, finishing third, and won a stakes race at Turf Paradise in January. May Be Fantastic Sa, the post-time favorite, was in tight between runners and finished third, three-quarters of a length behind Dig Deeper. Emilio Tapia had the call for trainer Ubaldo Guerrero and owner Orlando Guerrero. 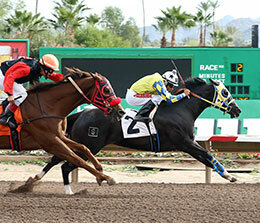 The 5-year-old horse is a multiple stakes winner with over $100,000 in career earnings, including wins in the Mike Hastings Memorial Stakes, Turf Paradise Championship, and AQRA Turf Paradise Derby. May Be Fantastic Sa was bred in Oklahoma by Gianni Franco Samaja. He is by Fantastic Corona Jr and out of the Tres Seis mare Darlin Treis. Completing the field were Sweet Babie James, El Tipasso, Frost Dalena, Captain On Takeoff, Special Train and Volcano.